People who know me closely, know that I like to help fix problems. I see solutions quickly and action them rapidly. Whether it is altruistic or some compulsion, is perhaps irrelevant. What is more relevant is that this leads me to say “Yes” reflexively when people ask for help. This trait has helped me to be valuable to my employers and has accelerated my development. It has meant that I have sacrificed my own priorities and direction to aid others, not necessarily a bad thing, as if we are working in a team, we should be aligned. It has also meant that I have created a dependency and expectation to help, and as a consequence at times limiting the ownership and development of others. In some ways it’s selfish, because I can, I do. I help them, I develop my abilities, they do not. It poses an interesting dilemma, how to distinguish when to say “Yes” and when to say “No”. My advice is to see it as an evolution. 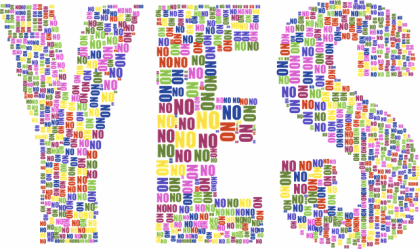 When starting out your career and life in general, try say “Yes” to everything you can. Make “Yes” your default response. This allows you to get exposure to a broad range of experiences – people, projects, life. This exposure enhances your potential and helps you develop Career Capital, a term Cal Newport coined. A term used to encapsulate those skills, experiences and additional work responsibilities you accumulate over your career which make you more valuable to an employer. As you take on more responsibilities. Begin to only say “Yes” when it is aligned to your priorities. It is not always easy to know, so see Chapter 4 on Focus and Chapter 13 on Success to help. If it is not aligned to your priorities, then default to “No.” Saying “Yes” at this stage is likely to result in you saying “No” to something else that is more important. Realise that it is much easier to change your “No” to a “Yes” later on, than the other way around. As you develop and taken on more responsibility, you may get to the point where “if not ‘hell YES,’ then ‘no.’” People live with many regrets, most of these start with a “Yes”. Time is your most finite and valuable resource, what we say “Yes” to is evidence of what we consider to be important, as this is what we are spending our most valuable resource on. Say “No” to the time thieves. Defer/delay – By saying you are in the middle of something important, can they come back in 20mins or next week. It is amazing how many people never come back. Give a reason, even better a nothing reason – Robert Caldini in his book Influence shows how people are far more compliant when given a reason. People expect context. Train people on your e-mail responses – A specific one, but it has become so key. It is amazing how quickly in the workplace your behaviour can creates expectations. If you respond out of office hours, people will expect you to. If you respond quickly, people will expect you to. I suggest batch your e-mail responses to set periods during the day that is convenient to you. Then to avoid the ping pong of you reply, they reply. If it takes more than one e-mail; follow up with a call. If you do not want a response until later. Schedule it to send later. Do you have any examples of when you have needed to say “No”? – What tactic did you use to do it “politely”? – Share them in the comments below. ← £214k, for half an hour of work – Is your pension missing out?